"Very Professional and she does Great work." "Amazing designer, would highly recommend." "My design is fresh, bright, joyful! It is perfect for our brand! Nina was fast and followed our exact specifications! " "Great eye, really good and fast turnaround. Highly recommended." "Nina, Does excellent work. Very professional "
"Nina is highly skilled at taking plain content and designing it to look professional. I appreciated her fast turnaround and keen eye for design and consistency. It was her efforts that were instrumental to making our project come to life. I recommend he..."
"Nina provides great designs, followed our brand guidelines well, and was extremely responsive to our feedback. She also helped turn our project around on a tight timeline. Great designer, we will work with her again. " "Easy to work with, excellent design skills." "Nina's work on our brochure stood head and shoulders above what we saw from other designers. She was quick with revisions and insightful with taking our brand and idea and translating it into reality. Great stuff!" "Nina's print work is fantastic. She gives thoughtful design suggestions, brings solid expertise into her suggestions, delivers turnarounds quickly, and is easy to communicate with. It's a pleasure working with her!" "Talented designer and very responsive to change requests. Highly recommend." "Nina was great! Always very quick and the designs are great." "nina was great. While we are working in different time zones, she was very timely with her work and answered promptly. She understood we were in a time crunch and worked very hard to get everything finalized. Would definitely recommend her and would lov..."
"Nina did a fabulous job with the design on these pieces! " "Talented, timely and responsive. Top marks." "I always hire Nina when I have picky clients. She is so professional and works with me until the project is perfect and the client is thrilled." "Amazing designer and great to work with as always!" "Excellent Work and fast service!" "Great communication and excellent execution of the project! Looking forward to working with Nina again! :)"
"Nina was extremely responsive and did an awesome job with a very picky client!" "Nina is a top class designer, very creative, responsive to change requests and delivers on a tight deadline." "Best designer ever! Brilliant, creative, intuitive, and absolutely reliable. Best ever! " "I use Nina for my pickiest clients because her work always pleases even the toughest critic. Awesome work as usual!" "Quick Turnaround, easy to work with!!" "Great work and a quick turnaround every time"
"Brilliant work, fast and responsive to design changes. Highly recommended." "My second project with this designer and am sending a couple more projects her way now. Highly recommend!" "Absolute perfection. Nina is brilliant!" "She did a wonderful direct mailer for us. " "Nina is a great designer, "
"Quick, effective design. Helped us find a missing portion of our brochure which was great!" "Nina did a fantastic job on turning this around so quickly and providing exactly what we were looking for :)"
"Nina is so easy to work with and does an amazing job!" "Pleasure to work with, fast, and great communication"
"Great job as always... Choose Nina!" "Good turnaround and final product." "Beautiful Designs, quick response. " "Nina was very accommodating and quick as always!" "Clean design and quick turnaround. Very pleased with the result. " "Exceptional, thorough and prompt as always - the best of the best! :)"
"Nina made a very nice and professional design with little briefing. She is very creative and understands the style you want to go with. Very nicely done and very pleasing to work with!" "Nina has been great to work with and has provided us with a great looking new marketing brochure. There have been no issues with requesting changes and amendments and she has been very patient. I would not hesitate to recommend and use again." "Beautiful clean design, it's like she read my mind! Managed to produce exactly what I wanted and did so extremely quickly. Thank you!" "Nina did a great job with very little direction! She was fast and responsive." "Nina was extremely helpful in the entire process despite my inconsistencies and hectic calendar. She helped refine our company's brochure many times over to ensure we had exactly what we needed. 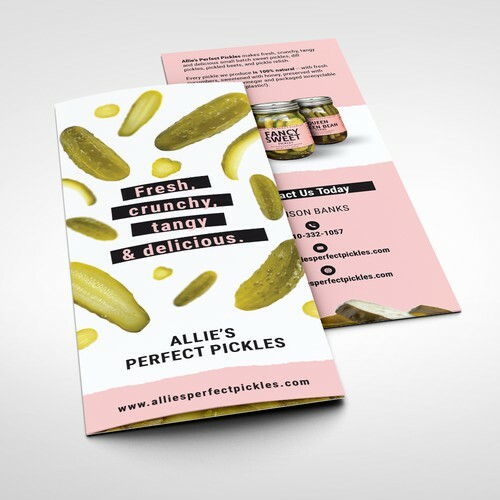 I highly recommend using Nina for any brochures that you m..."
"SUCH a talented designer! Nina is brilliant, intuitive, responsive and skilled--LOVE her!" "Great work on our first project together! You've had great ideas and feedback :)"
"It was a pleasure working with Nina. She made our first experience with 99designs a fantastic one. Her design skills are incredible, and she is fast, professional, friendly, and an excellent communicator. Thanks so much, Nina!" "nina was excellent as always!" "Nina is incredible. Brilliant, smart, fast, intuitive, reliable, and talented and dependable! Perfection! " "Great design- great communication- will use again- thanks Nina"
"This is my second cover design by Nina Z. She is creative, fast and easy to work with." "Excellent design work. Nina created a great brochure concept which fit the brand perfectly"
"Nina is a pleasure to work with, and she strives to deliver solid designs that will meet her customers' needs I highly recommend working with her!" "Design — 5/5 Communication — 5/5 Ease to Work With — 5/5"
"Super talented, fast and responsive." "It is ALWAYS a pleasure working with Nina. We've now done several projects together and each time she is patient, brings creative ideas we would never think of and does a fantastic job. " "Working with Nina is an absolute pleasure. Her work is creative and polished, and she works fast. I'll definitely go to her again." "Great job and a pleasure to work with. Very quick and professional. Would recommend." "The process and interactions with the Designer were GREAT! I feel have an excellent design. I would us 99designs for another project without hesitation." "Good Job, well done and with time efficiency "
"thanks for thé work "
"Excellent designer, fast, responsive and works great with deadlines." "Nina showed impeccable patience and listened to my every whim which resulted in a great final product book cover. I am impressed with work." "The reviews are true. Nina is fast, intelligent and talented. I hope she will have time for my next project:)"
"Great design! Fast work! Great communication. Thank you." "Thank you! Appreciate your expediency on this." "Always PERFECT! Innovative, thoughtful, imaginative, reliable and incredibly talented." "Nina was awesome to work with. She delivered a terrific book cover for us, that's gotten an overwhelming response. Super responsive, worked very quickly, and great to communicate with. Recommend her highly. We can't wait to work with her again!" "Great work!! Will work with again"
"Nina very flexible and thorough. " "Nina is very skilled, talented and responsive to change requests." "Great work - thank you for all that you've done on our eBooks!" "Very quick, efficient, understands vision for changes very well and great designer!" "Thank you for your EXCELLENT work! The design is beautiful and you worked very quickly which is appreciated by my team. Great work as always!" "Nina is amazing and I am so grateful for her professionalism and quality of work. I use her to design something every week. " "Thank you for a job well done. Looks gorgeous. xo"
"Super work! Thanks a mill, a pleasure to work with!" "Nina exceeded our expectations. We can highly recommend her. She works fast and very professional"
"I love Nina. She's amazing. This is the 5th project she's done for me. I'll continue to use her. " "Superb as always. Repeat work. " "As always, awesome work. " "We've worked with this designer on a number of projects, and she has been AWESOME every time! Can't recommend more highly. A+ work!" "Thank you for your beautiful design on our eBook! We love it and love your work. " "The absolute best - no complaints, nothing but raves - price, responsiveness, quality of design, positive attitude... absolutely everything you could dream for in a designer!" "Love working with Nina, very detail orientated and creative! " "Outstanding design & more importantly... communication!" "nina has concepts very different from the other designers and came up with a great approach that we ultimately selected as the winner." "I come back to Nina because not only are her design skills impeccable, but she delivers on time and is immensely patient and professional in the process. " "Nina worked with us on a unique project. She was flexible to work on expectations and pricing. In the end she produced just what we needed at a fair price. " "Couldn't have been more thrilled with this project and the work that it produced! Beat every deadline, produced professional-quality work, and consistently delivered more than her contract dictated - absolute perfection from start to finish! " "Nina is amazing. So patient and helped us get it just right. So pleased I found her. Have already hired her for ongoing work based on a superb job done on this. " "Nina was easy to work with. Would highly recommend using her. We certainly will. " "Nina is simply EXCEPTIONAL with her work! Not only was she exceedingly accommodating, her communication was great, and she paid extra attention to all the details. I strongly recommend Nina for your design projects and look forward to working with her ..."
"Quick, smooth and great outcome!" "Nina worked so hard on this project, helping me bring my vision to life. It's everything I wanted and more. She is such an incredible designer." "Nina is amazing. She's so awesome to work with and her designs always exceed my expectations." "Nina always provides great content in a timely manner. Great communication! Happy again! " "Nina was great to work with. She was very professional and patient with the changes and edits that I needed done to get my brochures and business cards exactly how I wanted them." "Nina is a great designer to deal with. She gets the idea, accommodates our needs and delivers fast. I like working with her! " "Fantastic , and Amazing. Simply great!" "Excellent work, great communication, thank you!" "Nina reviewed my request and came back with a template that was simple, easy to read and beautiful." "Nina is a treasure! Perfect in every way. Incredibly talented, reliable, brilliant. I have hired her for bookmarks, magazine ads, postcards and even greeting cards—each one is exactly what I hoped for—and more!" "Beautiful design, adaptive to changes. Loved working with Nina!" "Thank you for your hard work and beautiful design!" "Great experience! Love the design. " "Nina is a high-quality, professional designer who is so easy to work with. This is my second project with her and I'll be back for others." "Nina is great! Very creative and accommodating. Will definitely seek her out for future projects." "great job easy to communicate with will use again"
"Wonderful designer with excellent communication! " "Good design produced on a short timeline; responsive to comments and corrections"
"It was swift and neat! great experience, thanks! " "Exceptional designer with a keen eye for modern designs that truly stand out. Very responsive, coming back with revisions within an hour or two. We will definitely be using her again and we highly recommend this designer." "Very creative and fast worker. Will work with her any time again." "Excellent and professional design work." "Designer "Differentgirl" took the brief description of what I was looking for and nailed it in the first design, very easy to work with. " "Fabulous in every way. Brilliant!" "Have used this designer on a previous project, so wanted to maintain the same design. Different Girl understood the brief and provided the design to our schedule. Would use again for future project." "Great design and really helpful. Was a pleasure working with you." " Nina is perfection! I love working with her "
"Nina is an excellent designer. She produced a quality design that exceeded my expectations. I would recommend Nina as a designer to anyone." "Nina was great to work with. Communicated effectively and responded quickly. She worked hard to collaborate and create a final product we were really satisfied with. " "Excellent work, great designer and very responsive. Thanks." "nice and efficient! Very good designer to work with"
"Great job and awesome to work with! This was a project for a client and several people were making multiple changes. Nina worked with me until the project was perfect. " "Wonderful job! Nina came up with several creative options and dealt with many, many iterations. I work with many designers in my job and have a good basis for evaluating quality work. Nina was fast and responsive. I would highly recommend differtgirl." "Amazing! Easy to work with and very talented. " "Nina was spot on for the design and items we requested. She was easy to work with and very accommodating on the photo changes we made to make our project perfect!" "Excellent and easy communication. Gave us what we needed in terms of layout instantly. Pleasure to work with A+++"
"Nina did a great job in creating what we were looking for. She quickly made changes that we requested, and produced a clean and engaging final product. " "Nice and quick design with swift reponses!" "Nina is an excellent designer and provided a beautiful design. Also, the most difficult part of the design process is managing the feedback from the client and she did this very well. I would use Nina again for future projects and recommend her to others." "Responsive and up to standard design!" "Great job, very quick and friendly"
"Great work. Nice layout and design and very quick to respond." "Great & fast work. Easy to get in touch with. Creative ideas. " "Great Work. Fast response and keeps at me to finalise which is what I need"
"Amazing work! Very responsive and easy to work with. Followed up for a one-on-one project as well. " "We've created two new brochures for our company in the last two years. By pure coincidence, the winning designs we've chosen have both been differentgirl. The specific project requirements were followed to the letter, and we're happy with the final result." "Great job, thank you for your hard work!" "Good Work, Good Communication, Great Design!" "There is a reason why i've gone back 4 times for new jobs in the past month alone. SHE IS THE BEST. Hands down. Don't even bother with other designers! " "Great job, well done, very responsive to change requests. Highly recommend this designer." "Second project in two weeks -- going back for 2 more! She is AMAZING!!!!!!!!!!!" "WOW! Amazing design work and very fast turn around. Will be hiring her immediately for 2 more projects!" "She updated some previous work to evolve with our company. She is quick to communicate back and complete the work. Always provides us with a final product that is exactly what we are looking for. " "Great work! Your designs matched what we were looking for and you were very easy to work with." "Fast, responsive, creative and great to work with." "Excellent job! On brief, on time and a responsive and very creative designer. " "Good Job, creative design und quick handling. " "She did a great job and was very responsive. " "Design a brochure for our business as a custom new homes builder. This designer understood the brief and promptly made amendments to come up with what we wanted. " "Nice job and quick turnover. Recommended. " "I asked for a company brochure and i got exactly what i wanted. differentgirl made an excellent job, she was super fast and supported and took my wishes very well. To work with differentgirl was a nice experience." "Different girl did an outstanding job in understanding what I wanted to convey with my message, and getting close to the ideal brochure I had in mind, even though I left few precise indications in the brief. She paid attention to little details making s..."
"My third project with DifferentGirl. She is fast and her work is amazing!" "Great design, fast turnaround, professional"
"Quick, and great suggestions to what we thought was already good enough. " "She is simply the best! Her designs are amazing from the beginning and she needs no coaching to get an awesome product. Will continue to use her. " "Very responsive and thorough. " "Brilliant designs and easy to work with. Will definitely use her again!" "different girl understood our needs and pulled off the design job intuitively. We were able to finalize with minimal feedback and with very quick turnaround times. We'll hopefully have the honor again." "Made a beautiful brochure for us. Top notch, great designer to work with." "Super job. Very flexible and easy to work with. " "Always great working with DifferentGirl! Thanks again for the awesome job!" "This was my first time to use 99Designs, so I wasn't quite sure of the process. I probably should have been more specific about output format, specification, etc. But I learned a lot. I enjoyed working with differentgirl. Her design was spot-on to t..."
"Excellent work Nina. I have more brochures to do and they will be more ready next time so its less hassle on your end. Thank you, Dean"
"Quick, professional and only a few tweaks to build the design I was looking for. I have worked twice with this designer and plan on continuing to work with her in the future." "Excellent work and very responsive. I absolutely would hire her again." "Great design straight out of the gate, great communication and made the process super easy...:)"
"DifferentGirl was great to work with! We used her on a bunch for a couple brochures & direct mailers. Her work is extremely professional, and she is awesome to work with! " "Super designer. great ideas and good delivery." "Creative and easy to work with. Perfect."